Rajinikanth & Akshay Kumar starrer 2.0 has grossed over Rs 500 crore club at the worldwide box office, and its still going strong. Despite getting mixed reviews, India’s most expensive movie is doing well, thanks to its excellent VFX that makes it a visual spectacle. 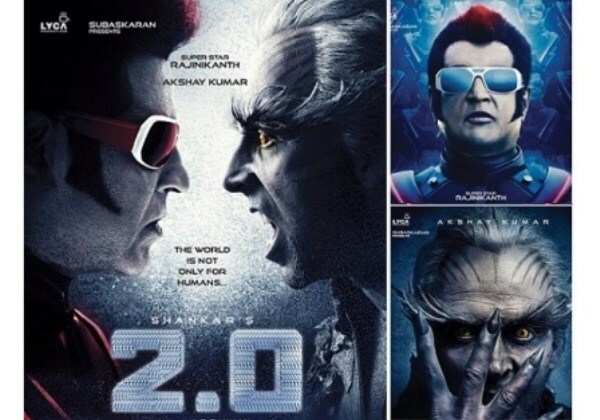 2.0 is also expected to get past the lifetime worldwide collections of movies like Tiger Zinda Hai, Padmaavat, Sanju, Sultan and Baahubali, but it’ll be interesting to see if it can get past the Rs 1000 crore mark surpassing Aamir Khan’s PK and Secret Superstar, and Salman Khan’s Bajrangi Bhaijaan. Shankar directed 2.0 is about Chitti the robot (Rajinikanth) taking on cellphone-hating Pakshi-Raja (bird king) played by Akshay Kumar. Directed by Shankar, the sequel to the 2010 hit movie Endhiran has been made on a budget of around Rs. 500 crores, making it the most expensive film in the history of Indian cinema. 2.0 (sequel to Robot/Enthiran) tackles the subject of mobile phone radiation harming birds. The film pits Dr Vasigaran (Rajinikanth) versus Pakshiraja (Akshay Kumar), an ornithologist who, angered by the destruction of birds due to mobile phone radiation, confiscates millions of mobile phones to create one angry bird who is hell-bent on destroying anyone using mobile phone. The scientist is forced to revive Chitti to defeat Pakshiraja. How is 2.0 compared to Enthiran (Robot) part 1? The first version Robot was a lot more entertaining, it had a little bit of romance, several fun moments and then the spectacle. Despite the film being humourless and the characters not given enough time to develop, the film does wow you with the VFX, the originality of ideas, and the vision. You can clearly see why its such an expensive movie. The first half is excellent, despite it focusing only on the technology aspect. The second half slows the tempo (a good thing) as the director tries to explain why Akshay Kumar turns into the antagonist. However, the last 20 minutes or so becomes a bit unbearable. Its like watching a video game where Chitti battles Akshay with several fight sequences (all VFX scenes). And there are multiple Chittis trying to get rid of Pakshi-Raja. In fact in one of the scenes, there are the normal Chittis and miniature Chittis which make you wonder if you’re watching a kids movie. And a lot of scenes in the climax looks similar to the ones that were used in Robot. Maybe, Shankar didn’t get enough time to edit, as the film has already been delayed so much time? Even Akshay Kumar’s character is one-dimensional and doesn’t do much besides fighting Chitti. Despite the negatives, its definitely a one-time watch. Its the last 15-20 minutes which mentally exhausts you and makes you feel that its an okay movie; until then things are just top-notch and wows you on several occasions. 2Point0 is a cinematic marvel… This has style with substance… Director Shankar is a visionary… He hits the ball out of the park this time… Akshay Kumar is FANTASTIC, while Rajinikanth is THE BOSS… SALUTE! A direct sequel to 2010’s Enthiran (aka Robot), the new film builds on what was promising the last time around and gives us more of it. But plot, story, and character development are sacrificed at the altar of spectacle.Sure 2.0 is mostly humorless and doesn’t have the lightness of touch that it could’ve done with. But the action, the VFX, and the sheer spectacle on display allow me to forgive many of its faults. Shortcomings notwithstanding, it is the victory of vision. Shankar has shown us that slick special effects blockbusters are very much within our grasp.I’m going with three out of five. Is there such a thing as an over-fertile imagination? What is that tipping point when dazzling becomes exhausting? And how many versions of Superstar Rajinikanth can one film juggle successfully?But what Robot had and what 2.0 lacks is a strong emotional quotient. The first film tackled complex ideas of human emotions and hubris and what happens when the creation turns on the creator. 2.0 is visually overpowering – the VFX are mostly first-rate – but the screenplay doesn’t offer the seamless mix of romance, drama and comedy. Some of the writing is lazy. While the VFX work is clearly on display in the trailer, it doesn’t come across as very gripping. May be the makers were under pressure to release the trailer, as their target date has slipped several times in the past. However, with legends like Rajinikanth, Akshay Kumar and Shankar teaming up, the movie’s release is being eagerly awaited by fan. In the past, several big names were approached to play the negative role – Aamir Khan, Hrithik Roshan, Amitabh Bachchan, and even Arnold Schwarzenegger, but nothing concrete emerged out of their discussions. Finally, the role of the villain went to Akshay Kumar. A report published in DNA had stated that Khiladi Kumar has charged a whopping Rs 25 crore for doing the film. Amy Jackson, who was Akshay’s co-star in Singh is Bling, also features in a lead role in the Rajinikanth-starrer bilingual film. Oscar-winning composer A R Rahman will compose music for the film. And with Akshay also stepping in, Robot 2 / Enthiran 2 is as mighty as it gets. Akshay Kumar spotted on the sets of Robot 2 with Rajinikanth, director Shankar and AR Rahman. “Rajini Sir is the real superstar. I would like to thank Shankar Sir for giving me the opportunity of working with a legend like Rajinikanth. I could’ve never imagined that I will get a chance to work in such a big and costly film like 2.0. I have done 130 films (in Bollywood). 2.0 was my 131st film. I can only say that during the making of those 130 films, I got to learn little from every film, but I was learning throughout the shooting of this film,” Akshay Kumar. 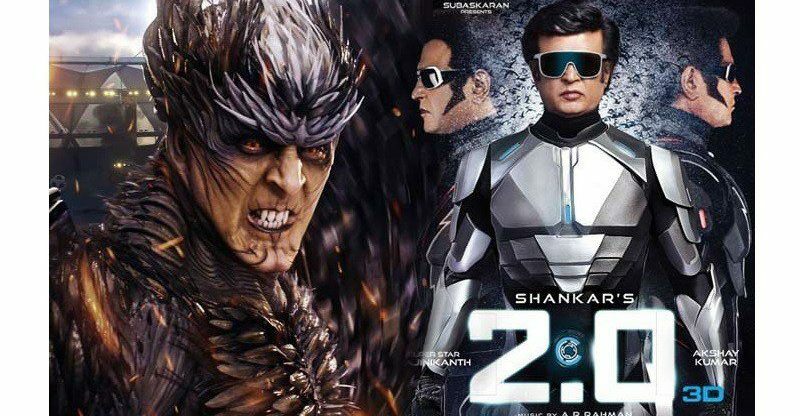 First, it was the news of a deferred released date of Shankar/Rajinikanth’s 2.0 that disappointed the fans, its now the turn of the makers to feel disappointed – a pirated version of the films’ teaser has been shared on social media. While most studios release the trailer/teaser before the scheduled time to generate more curiosity, in this case, the leaked version is not from the makers of 2.0 as the VFX for the film still needs to be completed. The grainy low-definition trailer is shoddy and ill-conceived. There are flying cellphones(yes!) and screaming tyres, but nothing that kicks your adrenaline. While Rajnikanth does his Chitthi act all over again, Akshay Kumar’s villainy looks cartoonish than sinister. The teaser only had temporary VFX shots and it’s an unfinished product, says the director. I’m sure this will force the makers of 2,0 to come up with a more inviting trailer at the earliest, else people may think that the sequel is just over-hyped (based on the leaked teaser). The film’s release date has been pushed back further, and the makers are not sure when it will be released. 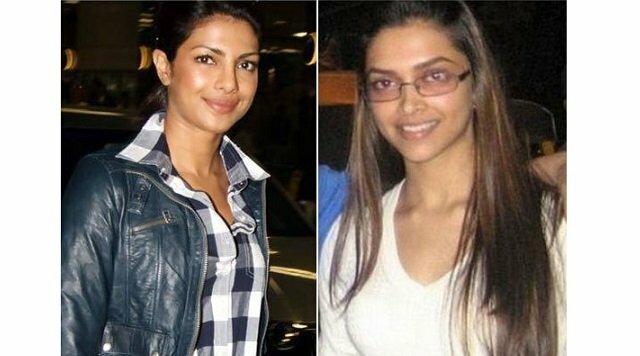 The film’s release has already been postponed on a couple of occasions in the past. It was first moved from January 26th 2018 to April 27, and the reason given was that Akshay Kumar’s Padman was relasing around the same time. Then it was said that the VFX work is taking longer because of which the release has to be postponed. It has again been pushed forward from April 27 to an undecided date, and Rajinikanth starrer Kaala will be released before 2.0. We hear that the studio that was doing the major chunk of VFX has gone bankrupt! Now that’s scary. Post-production is going on in full swing. Studios from around the world are involved in the VFX work. Apparently, the 3D and other VFX are not shaping up to the satisfaction of the team. “They are doing their best. And they do not want to compromise on the post-production. But the financial setback that they faced when the American company goofed up the 3D has been a hard blow to withstand. The film has gone grossly over-budget. The main actors Rajnikanth and Akshay Kumar have moved on. It looks like it would be a while before the film is completed and released,” says a source. “The teaser work of 2.0 is going in full swing at Mobscene, LA. It involves a lot of CG, so once it is done the teaser will be released,” director Shankar. A new poster of Shankar directed 2.0 is out, you can see Rajinikanth, with both Akshay Kumar and Amy Jackson in the poster of the movie. “I’ve never done a role like this in my entire career,” says Akshay, who is currently promoting the film in Dubai. Enthiran 2.0 has been made with a whopping Rs 450 Crore budget (making it the costliest Indian film to be ever made). But then the movie will feature the biggest stars of India (Rajinikanth, Akshay Kumar). Oscar Award-winning musician AR Rahman has scored the music, and the VFX designer is V Srinivas Mohan (of Baahubali fame). Srinivas Mohan has already mentioned in his earlier interviews that the VFX of 2.0 will be on par with a Hollywood film. Besides, director Shankar has roped in Hollywood stunt choreographer Kenny Bates (worked for action-heavy flicks like Transformers, Die Hard). Now you know where all that money is being spent. The good thing for the makers of 2.0 is that they have already begun on a great note. In what could be termed as one of the biggest-ever TV deals in Indian cinema, the satellite rights of 2.0 have been sold for a staggering Rs. 110 crore to Zee TV (deal includes the rights of Telugu, Tamil and Hindi versions). During the first look launch of Shankar’s 2.0, many expected the spotlight to be on the films first looks (posters), and its mind-blowing star cast – Rajini sir, Akshay Kumar, Amy Jackson, director Shankar and music composer AR Rahman. After all, a staggering Rs 6 crore were spent on the Rajinikanth-Akshay Kumar’s 2.0 first look event. However, Salman Khan gatecrashed (came uninvited) into the event, and took everybody by surprise. But nobody is complaining because it only raised the star-power of the event. Lara Dutta, who worked with Akshay Kumar in Singh is Bling, after a gap of several years said that Akshay had matured a lot as an actor. While we all know that he’s the original Khiladi who loves to do dangerous stunts, and also is very good at comedy, Akshay seems keen to experiment with his acting skills. That is probably the reason he agreed to play the baddie opposite Rajinikanth in Robot 2 or Enthiran 2. 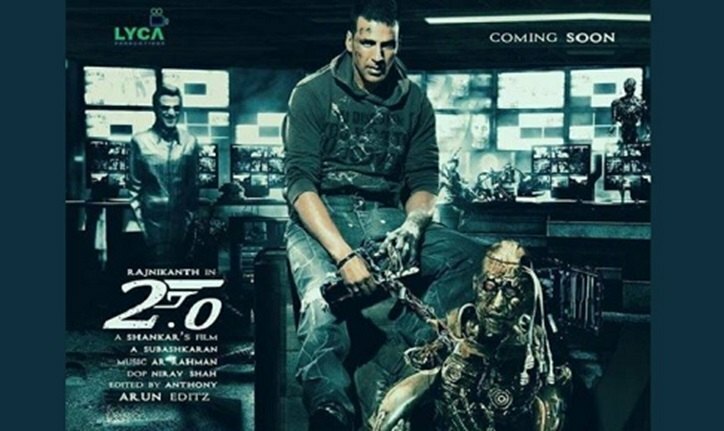 Bollywood ‘Khiladi’ Akshay Kumar is play the villains role in Shankar’s Robot 2, opposite Rajinikanth. In the past, we have seen how director Shankar completely transforms his characters (as seen in the movie Robot and then the movie ‘I’); even this time the audience is expecting something extraordinary from the talented director. And going by the leaked images of Akki from the sets, Shankar seems all set to wow cinema-goers with his next one.